With each new project, Alex Pettyfer has been moving further from his early days in Hollywood as a teen heartthrob. With last year's The Strange Ones (review), and The Last Witness earlier this year, he has re-emerged as a more mature performer and Back Roads presents yet another side to the actor: director. Adapted from Tawni O'Dell's best-selling novel of the same name by O'Dell herself and acclaimed writer/director Adrian Lyne (Fatal Atraction, Jacob's Ladder, Unfaithful), Back Roads stars Pettyfer as Harley Altmyer, a young 20-something who has been left to care for his three younger sisters after his mother is convicted of murdering their father. Harley is doing his best but living in a small town doesn't offer a lot of job prospects for a high school graduate with limited skills, and particularly not for relations of a convicted murderer. Though his dreams for college came to a screeching halt when he was suddenly thrust into the role of caretaker, Harley does what he can, working two jobs to keep food on the table, attending the mandatory counselling sessions and trying to navigate his sisters, particularly Amber, the eldest, who is going through her own destructive form of grieving. The family's meagre existence is made more complicated when Harley becomes romantically involved with a married neighbour; a relationship he is emotionally incapable of handling and one that raises deeply buried secrets Harley and his sisters would rather forget. Back Roads tackles child abuse by introducing us to a family fraught with it; detailing how the abuse affects not only the victims directly but those around them as well. Just when you think the Altmyer's have hit rock bottom, the story takes another turn and digs the entire family into an even deeper abyss. As actor, Pettyfer delivers a subtle performance, at once hardened by his situation but also vulnerable and deeply distraught. Nicola Peltz, Chiara Aurelia, and Hala Finley, the young women playing his sisters, are all quite good but the real gem of a supporting character is June Carryl. A bit-part actress who appears regularly on TV and in films (she recently played the sheriff in Under the Silver Lake (review)), she is wonderful here as the heart of the story, the one person who truly cares for Harley's well being. As director, Pettyfer is bold. With the aid of cinematographer Jarin Blaschke (The Witch), the film features some beautiful and haunting moments. Particularly memorable are the film's three prison visitation scenes. Each scene is already emotionally charged but Pettyfer, Blaschke and editor Kant Pan use their entire arsenal to deliver an additional punch. Back Roads is a difficult watch. There are no happy endings here and Pettyfer doesn't shy away from the troubling subject matter. There's no sugar-coating the situation Harley and his family find themselves in and Back Roads ends exactly as you'd expect it to: miserably, but that doesn't detract from the fact that the film also presents a promising new chapter in Pettyfer's career. 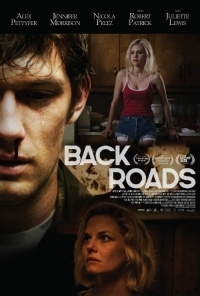 Back Roads opens theatrically and is available on demand December 7.